U.S. companies, on average, have budgeted for employee salary increases of about 3 percent this year, which is the same as in 2016. With unemployment at a 16-year low, there’s upward pressure on pay rates. However, businesses are taking a cautious view of long-term economic growth, opting to keep salaries in check to maintain a modest hiring budget. Still, employers remain fully aware that salary outweighs other considerations while vying for top talent in a shallow hiring pool. When deciding whether to accept a job offer, professionals across supply chain, human resources and non-clinical healthcare sectors prioritize salary above all other factors, according to a Google Consumer Survey conducted by Ajilon in March 2017. Companies also recognize that extending attractive pay to in-demand people reduces turnover and its associated costs. Nonetheless, budgets enforce conservative spending practices, so employers need to look beyond salary when building their team. Here are some approaches to keep in mind. The workforce is progressively trending younger. Millennials are already the dominant generation in sheer numbers with baby boomers headed toward retirement. Ajilon’s Google survey found 31 percent of employed millennials are interested in new job openings. Aside from salary, millennial respondents ranked opportunity for growth as the strongest draw to accepting a job offer. Growth can mean taking on added responsibilities, increased interactions with upper management, input into decision-making or learning new skills. Firms in the know also connect early with promising young recruits. Almost three-quarters of recent grads surveyed by Accenture Growth reported having worked an internship, apprenticeship or co-op during college. Top performers gravitate toward companies that clearly align personal and corporate values. Although your company can’t appeal to all people in every regard, be honest and upfront about core areas. Clearly let candidates know where you stand on customer service, innovation, social responsibility and market leadership. Perks such as flex-time and the option to telecommute show support for achieving work-life balance. The Google research revealed that women candidates tend to value job flexibility even more than growth opportunities. One way around a limited hiring budget is to pay bonuses tied to individual, group or company-wide goal achievement. Eighty-four (84) percent of organizations use such “variable pay” mechanisms, up from 80 percent in recent years, according to the WorldatWork 2016-2017 Salary Budget Survey. A 2016 report from the Society for Human Resource Management showed 43 percent of organizations offering spot bonuses or awards for exceptional performance, compared to 38 percent in 2012. Research from Willis Towers Watson estimates that discretionary bonuses for special projects or one-time achievements will average 5.6 percent of salary for exempt employees in 2017, a bump from the 5.3 percent average bonus awarded in 2015. Progressive companies continuously refine the overall employment experience, striving to keep workers happy and engaged. When that happens, word-of-mouth referrals spread, widening the pathway for top talent to explore what your company has to offer. Hiring research shows that stability, opportunities for career growth and the chance to work with a high-caliber team are the top factors associated with a good employer reputation. On the flip side, concerns about job security, dysfunctional teams and poor leadership contribute most to a poor reputation. Almost half of people surveyed by LinkedIn and ICM Unlimited said that they would completely rule out working for a company exhibiting the aforementioned negative brand factors. “Even a 10 percent raise would only tempt 28 percent of them to join such a company,” the report says. Employer branding company Universum points out that employers who want to establish a truly great reputation need to take some key actions. First, they must identify the key interests of potential employees. Then, pinpoint what differentiates their employee experience from competitors. Finally, deliver on promises made during the hiring process and in day-to-day work. Employers should also measure brand awareness through external surveys and social media engagement metrics. 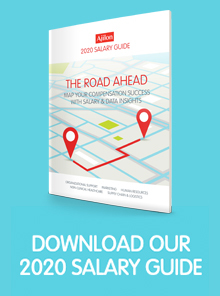 For further insights on how to recruit and retain the best talent in a tight hiring market, grab a copy of Ajilon’s Salary Guide.